Today is Deepavali, and I would think that most people will sleep late and will be somewhere other than Sungei Buloh Wetland Reserve. We have much flora growing on our shore, and most of these unfortunately are not indigenous to our land, but were planted by early settlers as well as our attempt to green the nation. 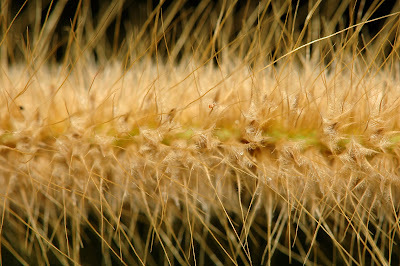 The Elephant Grass (Pennisetum purpureum) originates from Africa and is now quite a common sight here. 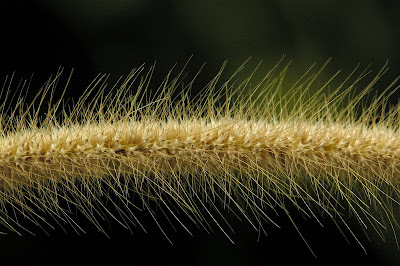 This grass can easily grow to a height of 4 m or more. Used to be gathered as fodder, but now they grow wild. 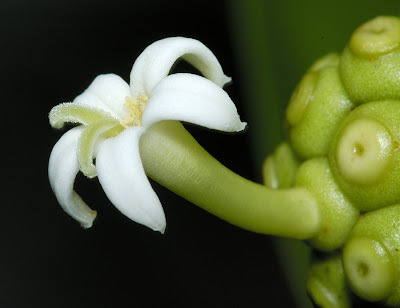 Below is a picture of the inflorescence. Closed up of the flower. Fern – having neither flower nor seed, this plant propagates by spores which is being produced from the underside of the leaves. 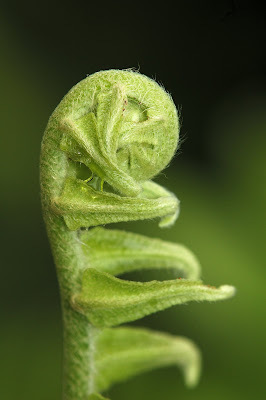 When the leaf first emerges from the centre of the fern, it is curled, and to a certain extend has the resemblance of a “foetus”. Slowly, it will uncurl itself, and a new leaf is formed. 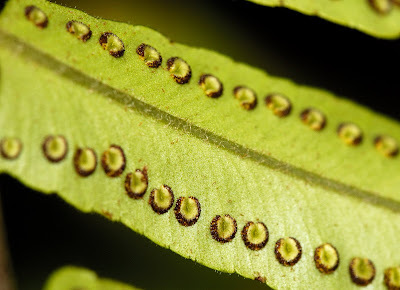 From this image of the underside of the leaf, there seems to be “holes” where the spores are produced and released. (Try to search for articles on fern, but did not go very far). Along the mangrove area of Kranji Trail, there are a lot of Noni Plant (Morinda citrifolia). 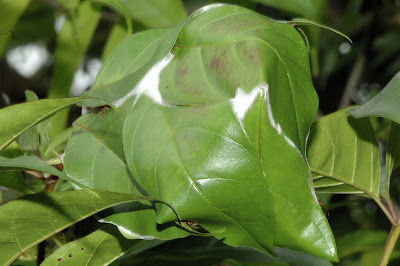 The Malay calls it Mengkudu, but the common name Noni as adopted by most of us came from Hawaii. 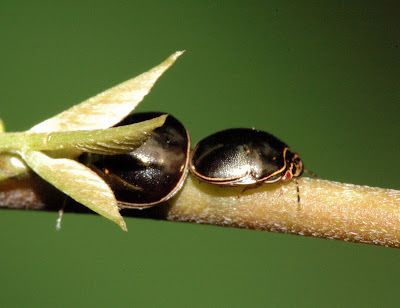 This plant has both the medicinal value for the human, as well as one of the favourite home for the Weaver Ant (Oecophylla smaragdina). In fact, every part of this tree, can be eaten or to be used to treat various illness face by us. Previously before the convenient of medicine, this tree has been used to treat eye, skin, gum, respiratory, constipation etc. The bark of this tree is also produced a purplish red or brown dye that is used in making batik. 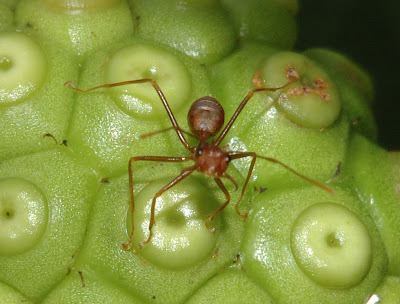 Somehow, the Weaver Ant (Oecophylla smaragdina) is attracted to the Noni, and build their nest. 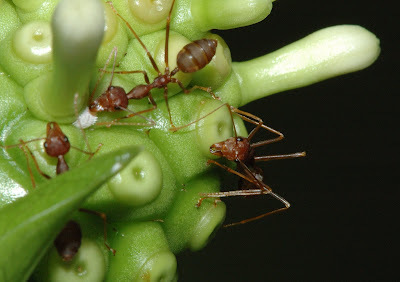 The weaver ant builds one of the most intriguing nest in the family of Ants. 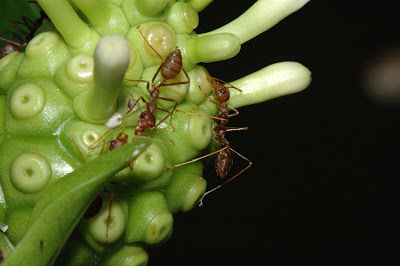 The Weaver Ant will find two leaves, and form an ant-chain and slowly close the gap between these leaves. 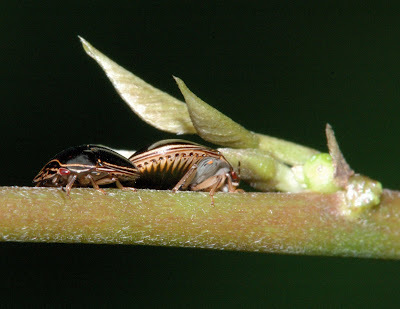 Once it is closed enough, the ant will carry their larvae in their mandible and squeeze out silks which act like glue. Interestingly, only the larvae is able to produce this silk. The adult weaver ant is incapable of this act. The colony can span many trees, with the queen ant in the nest. In my attempt to take the picture, this Weaver Ant was in an angry posture, as to tell me to back off. 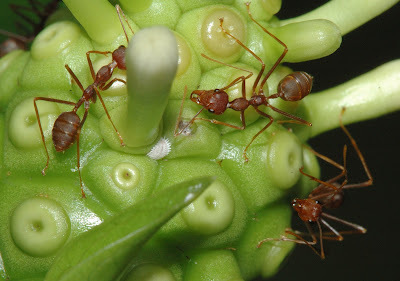 In the past, farmers encouraged the Weaver Ants to build colony on their plants which offer protection to their crops. Now this has been revived, and definitely it will be one good way to grow organic food, provided you know how to handle the ants! 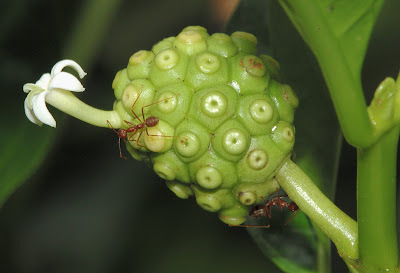 The Noni that I came upon was in a cluster with the Weaver Ant Nest nearby, the weaver ant was busied harvesting nectar from the Noni Flowers as well as the Mealy bug (Cataenococcus hispidus). The weaver ant will stimulate the mealy bug with its antennae, and in response will produce a sweet liquid which the ants will consume. 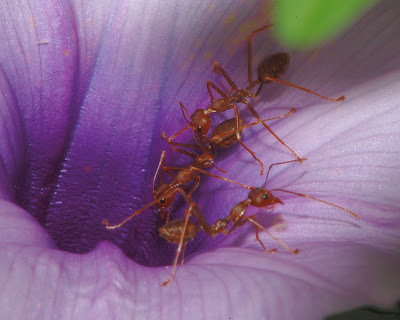 The Weaver Ant can also be found in the Sea Hibiscus plant, and they are fiercely protective of their host. 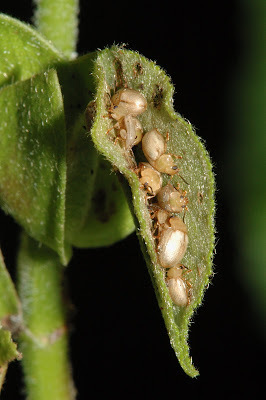 Observe the 3 shots below (shot in sequence), where the ants have obtained the sweet gems from the mealybug. Notice the liquid in the mandible of the ant. Beside foraging in the Noni plant, the Weaver ants were seen harvesting nectars from other plant, and in this case the Morning Glory. Common Sun Skink (Mabuya spp), this is a lizard but unlike lizard, skink has a smooth and overlapping scales like the snake. The interesting feature of the skink is actually the “missing neck”. Did not realize that there was a pair hidden the undergrowth until I downloaded the shots. They would have gone un-noticed if they have not tried to avoid me by scurrying away into the undergrowth. Along the way, I came across this partially closed leaf which was housing a family of beetles (unknown). These look liked juvenile beetles. And on a separate branch, I found this pair of shiny beetles with “red eyes”. Looks like they were in the process of mating! (Again a search through literature and Internet did not prove fruitful in coming up with the ID). Glad that I made my way from the maddening crowd and into Kranji Trail. 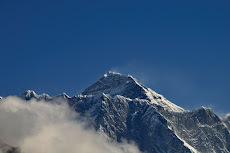 Though I walked a short distance, there were much to be seen. I think the skink is not an Emoia but a Mabuya spp. Thanks for the correction. How does one tell them apart? 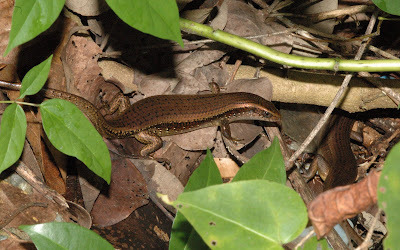 Nick Baker's site has species desciptions for the various skinks you can find here, see Ecology Asia. Hi! I came across your blog while looking for photos on Weaver Ants. I would like your permission to use the nest photos for a poster project for my school (NUS). Please get back to me at jasqxl94@gmail.com. Thank you very much! Hi! I'm a student at NUS and ma currently doing a poster project for a module called The Natural Heritage of Singapore (SSS1207). I would like your permission to use use photos of the Weaver Ant Nest for my poster! Do get back to me at jasqxl94@gmail.com. Please and thank you very much.